At the end of the celebratory Charles Dickens bicentenary year, a new feature film adaptation of Great Expectations hits the silver screen. The classic story charts the progress of orphan Pip whose life is changed forever when local spinster Miss Havisham invites him into her home to become a companion to her adopted daughter Estella and a mysterious patron then pays for him to travel to London and become a gentleman. Directed by BAFTA award winning Mike Newell and featuring a stellar cast this is one of the must see films of 2012! The host of familiar faces include Jeremy Irvine (War Horse) who plays Pip, Ralph Fiennes (Harry Potter series) as convict Abel Magwitch and Helena Bonham Carter (The King’s Speech, Alice in Wonderland) plays the tragic Miss Havisham. They star alongside Robbie Coltrane (Harry Potter series) Jason Flemyng (X-Men) and comedian David Walliams (Little Britain). Since Charles Dickens has many strong connections with Kent, the county’s varied landscapes inspiring the settings of many of his novels, the production chose to shoot at a variety of Kent locations. The picturesque St Thomas A Beckett Church in Fairfield was a perfect location for the first meeting between Pip and escaped convict Abel Magwitch as it stands isolated on the Romney Marsh and epitomises the bleak and mysterious setting described in the novel. This is not the first time the church has been used for filming as it has previously featured in Parades End (2012) and the BBC’s 2011/2012 adaption of Great Expectations. Swale Nature Reserve, Shellness is a small coastal region on the Isle of Sheppey which is home to several private properties, a secluded beach and a WWII lookout on a remote part of the island and was used to film a childhood montage featuring young Pip playing along the beach. Shellness has been previously used as a filming location by Strawberry Fields (2012). The Oare Marshes in Faversham were used as the setting for the blacksmith’s forge. Managed by the Kent Wildlife Trust they are part of an 81 hectare stretch of marshland, freshwater dykes, sea wall and salt marsh and were previously used by independent film The Hide (2009). The Great Expectations team also used the Historic Dockyard in Chatham to shoot a warehouse scene with Pip and Herbert at the end of the film. A popular filming location, the Historic Dockyard in Chatham has also welcomed productions such as the 2013 feature film adaption of Les Miserables ,Sherlock Holmes: A Game of Shadows (2011) and BBC’S Oliver Twist (2007). Elmley Marshes, Stangate Creek and the Thames and Medway Canal were also featured as various marshland locations, including the final dramatic escape sequence featuring Magwitch in a chase scene. 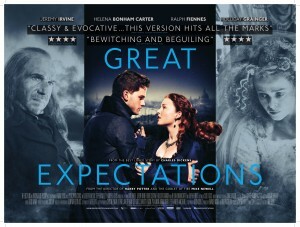 Don’t miss Great Expectations which is set for cinema release on 30th November 2012. This entry was posted in Filmed in Kent and tagged David Walliams, Elmley Marshes, feature film, Great Expectations film locations, Helena Bonham Carter, Holliday Grainger, Jason Flemyng, Jeremy Irvine, Mike Newell, Oare Marshes, Ralph Fiennes, Robbie Coltrane, St Thomas A Beckett Church Fairfield, Stangate Creek, Swale Nature Reserve Shellness, Thames and Medway Canal, The Historic Dockyard Chatham. Bookmark the permalink.